The future for Robert Stock seems very bright, as the hard-throwing right-hander established himself in 2018. The Padres may have found a gem in Stock, and here is a look at his PNO (positives/negatives/outlook). Robert Stock certainly did not take a conventional road to the major leagues. Drafted as a catcher by the St. Louis Cardinals in the second round of the 2009 MLB draft, the 29-year-old toiled in the minor and independent leagues for nine years before making his MLB debut as a hard-throwing relief pitcher this past June with the San Diego Padres. 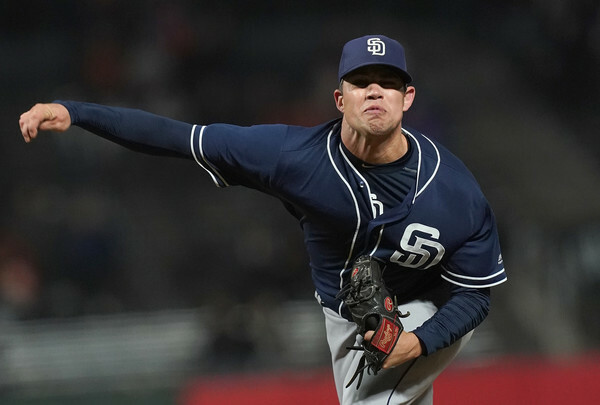 Now that Stock has his foot in the proverbial major league door, however, the right-hander seems to have carved out a niche for himself in the Padre bullpen, at least for the time being. What jumps out the most about Stock to Padres fans — and likely the hitters he faces — is his fastball velocity. Topping out at 100 MPH at times, and averaging 97.5 MPH, Stock’s fastball ranked within the top 15 of average fastball velocity in all of MLB. Given that he threw the pitch 58.9% of the time in 2018, his high marks in that department are encouraging. Of course, fastball velocity alone is not nearly enough to succeed in the major leagues, as professional baseball is littered with failed fireballers who struggled to find the zone. It’s in this area that Stock shows signs of being a legitimate force to be reckoned with out of the Padre bullpen, though. He averaged just 2.95 walks per nine innings last season (BB/9), a solid amount lower than the league average of 3.29 BB/9 in 2018. Stock’s command within the zone is impressive, especially given his high-octane pitching approach, but his ability to get batters to swing and miss has been equally of note. His average of 8.62 strikeouts per nine innings (K/9) is higher than the league average of 8.53 K/9 in the 2018 season. Narrow your analysis to Stock’s year 28 season versus an MLB average year 28 season and the gap becomes greater, with Stock’s 8.62 K/9 outdoing the league average of 6.67 K/9 by nearly two strikeouts per nine innings. If nothing else, his success compared to other pitchers his age shows that Stock may have more left in the tank than similarly aged players, perhaps due to his unconventional baseball background and road to the major leagues. Regardless, Stock’s command and strikeout success culminated into stellar numbers for any big leaguer, let alone a rookie: a 2.50 ERA in 32 appearances with a 1.261 WHIP. The most obvious factor working against Stock moving forward is his age. A major league debut at age 27 is not uncommon, but as a high-velocity pitcher, durability could be a potential concern. Given his ability to maintain his arm strength over the course of his career, though — including a position change — this worry may not be well founded, and only time will tell whether he can keep up the triple-digit velocity that has been central to his success. Regardless of Stock’s age, however, he has just 39.2 innings pitched at the major league level and has yet to pitch a full season with the big league club. This isn’t necessarily a completely negative thing, but it’s hard to make a definitive judgment on Stock’s skills until he turns in an entire major league season. 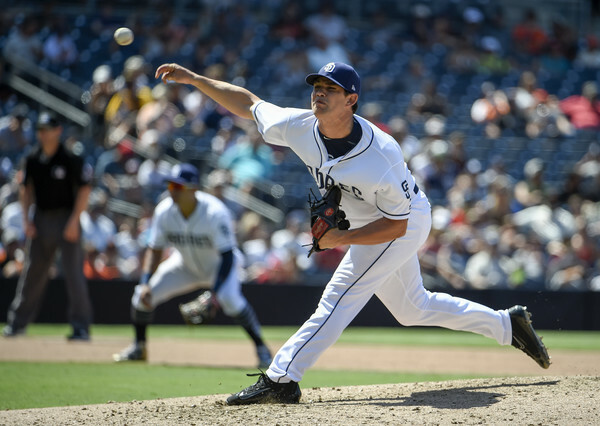 More time with renowned Padres’ pitching coach Darren Balsley, though, will certainly be a positive for Stock in his sophomore MLB season. Stock is a young, affordable, and controllable asset for the Friars, and he possesses a unique skill set that set forth excellent numbers in 2018. Contract-wise, Stock won’t be arbitration-eligible until 2022, and won’t reach free agency until 2025, which leaves plenty of time for the righty to refine his pitching in San Diego. 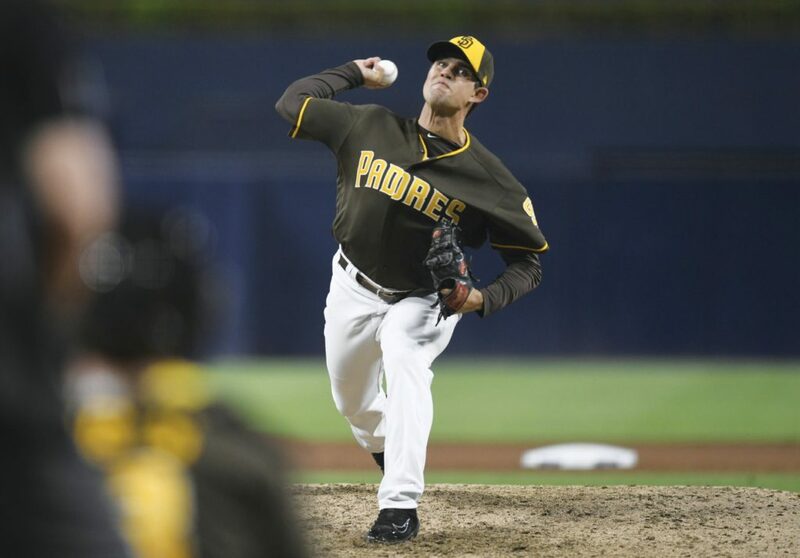 Expect to see more of him out of the Padres bullpen in 2019 as he continues his young MLB career and enters his first full big league campaign.